Makes 1 gallon (4 litres), this beer utilises medicinal and magical herbs, and was prepared with the conscious intent to nourish body and spirit. Place the energy of good, conscious awareness in all food and drink you prepare. Cook (and brew) with love. Take a little over ½ ounce (16 gm) of equal parts dry herb of hawthorn berry, damiana, elderflower and hops. Boil a quarter of the water in a pot, add the herb, reduce to 150 F (65 C) and heat for half an hour or so. While this has started, take the rest of the liquid and add a pound and a bit (0.5 kg) of liquid malted barley, bring up to the same temperature and heat for 90 mins. When the herbs are ready, strain them, and add the strained liquid to the malt mix as it continues cooking. Allow to cool to about 70 F, then add a pound or so (0.5 kg) of rapadura or raw sugar, and stir until sugar is dissolved. Allow the mixture to cool to lukewarm, then decant to your fermenting vessel. You can use one with an airlock, but there really is no need if you are careful with cleanliness. 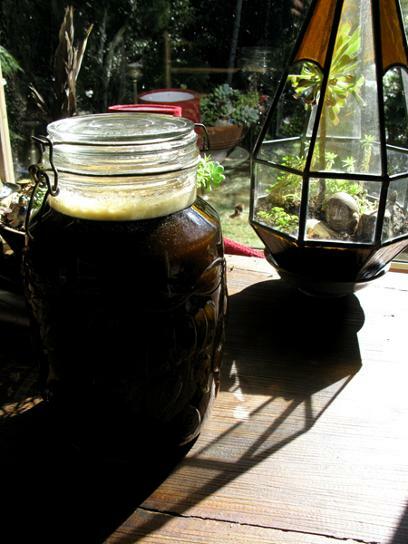 I use for this beer a large glass jar. I remove the rubber seal, so the glass lid contacts the rim enough to stop too much getting in, but also allows the CO2 out. I then cover this with a teatowel, and put near the fire (it was made in the winter). When in the vessel, and while still warm, take some of the strained liquid from a ginger bug or similar yeast starter. If using a ginger bug jar, put a spoon all the way to the bottom of the jar, where you will see a white sediment. This is a mixture of spent and living yeast cells. Make sure to include some of this. Mix the starter with lukewarm water, then strain into the decanting vessel. Give the mix a stir, then close up. As you see from the photo, fermentation has begun in my beer after only 12 hours. The ginger bug starter is not even necessary – the ginger bug fermented using wild yeasts in the air of my home (they are all around us), and the beer would ferment using these too. The ginger bug starter merely makes it happen sooner, and adds a bit of spice to the beer too. Fermentation should cease sometime between 1 and 2 weeks. Prime a small bottle with 3 g, a large bottle with 5 g of sugar, decant and cap. Ready to enjoy from 2 weeks, but age will improve.